Earth Day reminds us all to work toward a healthier environment. A 2016 study by the Environmental Protection Agency found that the average American throws out more than 4 pounds of garbage every day, a lot of waste going into a landfill. New Yorkers cut down on waste by recycling and shopping with reusable bags. 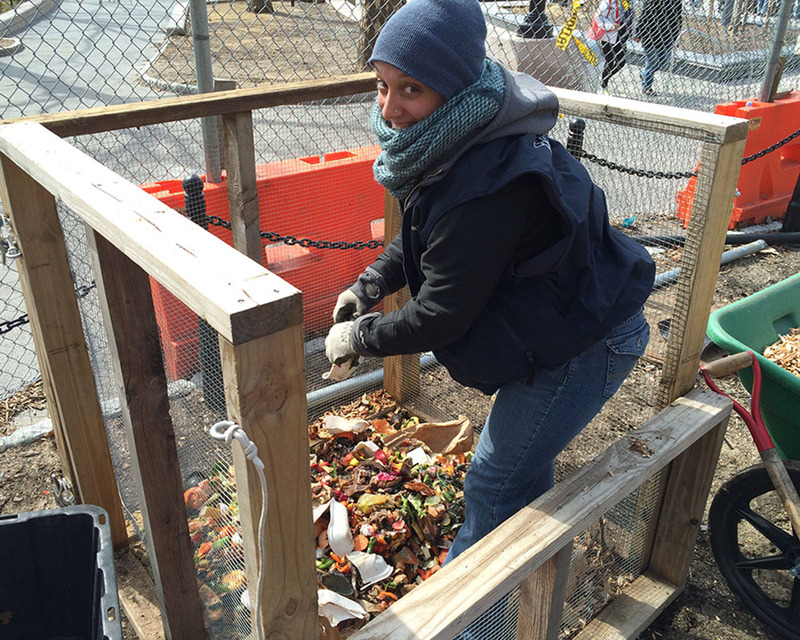 Now you can compost in the middle of the city too. No backyard or worm bin required! The Battery Conservancy’s partner GrowNYC, at their 60 New York City greenmarkets, accept household kitchen scraps to compost on your behalf. Check here to find your local compost drop-off location. By composting your food scraps, you help curb greenhouse gas emissions and provide important nutrients to your city’s gardens, The Battery included. Non-greasy grains: rice, bread, cereal, pasta, etc. Meat, dairy, or anything with oils, as they can attract pests. 5,000 children visit The Battery’s educational production farm each year to study environmental stewardship through organic vegetable farming. These curious young farmers are fascinated by the park’s biodiverse landscape – especially our compost bins and the insects that help break down scraps into healthy soil. Our farmers recommend that you save compost materials in a plastic container or bag kept in your fridge or freezer to eliminate household odors. Once the container is full, drop it off at your local farmer’s market on a regularly scheduled composting day. If you have the space – a backyard, patio, or basement will do – you can take it a step further and start your own worm composting bin. These can be purchased online, and a DIY version can be made inexpensively with a few 5-gallon buckets and a drill. The worm of choice, the red wiggler, will make fast work of your food scraps, keeping the operation smelling fresh and earthy and providing you with top-quality fertilizer for your houseplants and garden. As a waterfront park, we take sustainable park management very seriously, which is why we compost. The nutrient-rich soil we create goes directly into our garden and vegetable beds. Sign up as a volunteer, and process compost with us every Wednesday. Share this blog post with family and friends. And please visit The Battery as we continue to set the highest standards of environmental sustainability!